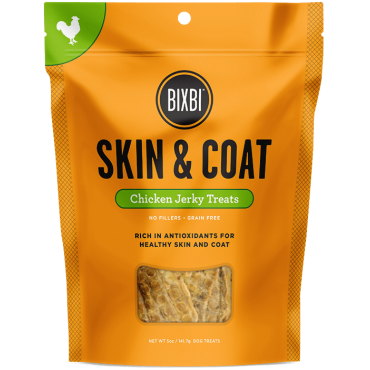 BIXBI® Skin and Coat jerky treats are loaded with naturally enriching whole foods that help support shiny, full-bodied coats and healthy skin. Packed with antioxidants, vitamins and minerals, these Jerky Treats provide protein-rich nutrition that will have your dog looking great and feeling even better. Chicken, sweet potato, vegetable glycerin, ground flaxseed, ground chia seed, dried pumpkin, salt, citric acid (a preservative), vinegar, mixed tocopherols (a preservative), rosemary extract.